Am I opening presents early, when Smokeymas is still a week away? 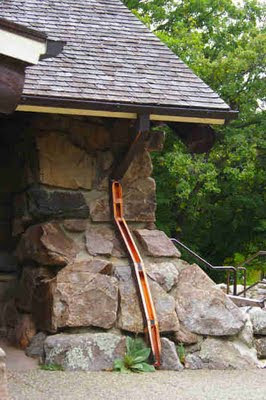 Not really, I found this CD, "In the Long Run" by the Fiddlin' Foresters, at ARC today. 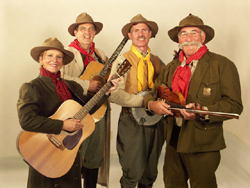 I had no idea that (a) the US Forest Service had an "official old-time string band" and (b) that their website had been presidentially singled out by Barack Obama as an example of government waste. Was that a taxpayer-funded banjo too? Thank heaven we have saved $10 annually on domain registration fees. The deficit will melt like snow in May if we keep this up. The album is still available. I played it on the long drive home from Colorado Springs. They do a tricky thing in the middle, moving from the campfire-singalong jollity of "Smokey the Bear" through another cut and then into "Cold Missouri Waters," which is a song I rarely listen to because it interferes with my vision, and that's not what you want at 65 mph. Jane Leche gets into Joan Baez territory with the vocal track (YouTube). "Is that about a wildfire?" M. asks. "Mann Gulch," I manage to say, although my voice sounds funny. But let's be real. The song is a weeper, but I was not even born yet when the events took place. I am thinking more of a sunny dining hall at the Wheaton College science station/summer camp in the Black Hills National Forest of South Dakota. A boy sits off in a corner while his father, the Pactola District ranger, gives some students a quick version of what would be today the S-190 and S-130 "red card" wildfire-training classes, in case they have to fight a fire on or near their 50-acre site. Sheet music to "Smokey the Bear" sits on the rack of the upright piano in the dining hall, and the ranger is telling the students how you should never run uphill from a fire, how something bad happened in Montana not too many years before. US 85, going up the western edge of the Black Hills in eastern Wyoming. It would be something like, "Took all the bears, put 'em in a bear museum / And charged the people fifteen dollars just to see 'em." All through our recent trip, I would do something like leave the cooler outside our pop-up trailer, catch myself—"A bear might get into it! "—and then realize that there are virtually no bears in the Black Hills. If you see a black bear, you are supposed to inform South Dakota Game, Fish and Parks, which categorizes them as "state threatened," and fill out a "Rare Species Report Card," available as a PDF download from the web site. And we could do our own bear-reintroduction program. After all, there are plenty in Colorado, where they have been taking food out of the mouths of the poverty-stricken Aspenites. From capture to release should not take more than ten hours, on average—not too long for the bear to be confined. It's feasible. Really, I am surprised that more black bears have not wandered over from the Bighorn Range or elsewhere in Wyoming. Too much open country, coal mines, Interstate 90, etc. in the way? 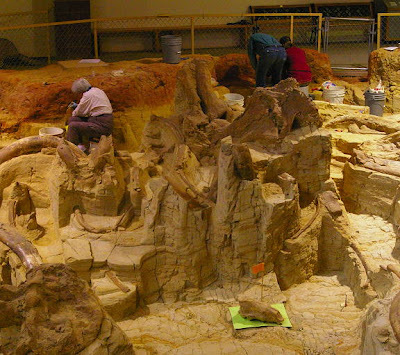 Above: Earthwatch volunteers excavate Columbian mammoth skeletons. The skull of a short-faced bear sits on the green sheet of paper at lower center. Thirty-five years ago a bulldozer operator clearing ground for a subdivision on the edge of Hot Springs, South Dakota, grazed some Columbian mammoth bones—and realized that he had hit something important. 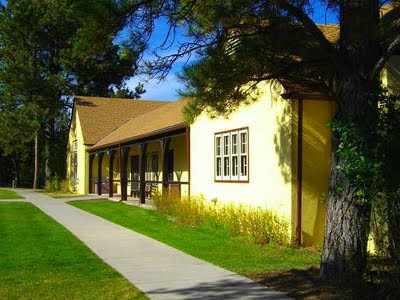 Today that spot is The Mammoth Site, a combination of working excavation, museum, laboratory, and gift shop. It is disquieting and sad, as M. noted, that all these big animals died struggling to breathe—except, perhaps, the short-faced bear. Did it climb down to gorge on mammoth meat and eat itself to death? Couldn't a big, agile bear make it up the slippery slope of decomposed shale? Or not? It's a little touristy—get your mammoth hand puppets and key chains here—but definitely worth seeing. In other ancient proboscid news, a baby Siberian woolly mammoth found nearly intact has provided more information about the species not obtainable from fossils. "We had no idea from preserved skeletons and preserved carcasses that young mammoths had a discrete structure on the back of the head of brown fat cells," said Prof [Daniel] Fisher. Meanwhile, on June 1, 2009 two Colorado boys were poking around in a creek bed. They were not engaged in organized youth activities, mentored by adults and involving clear boundaries and a rulebook. They almost certainly were not wearing helmets. "We were just thinking about walking up and down that stream and looking at the side of the banks to see if we see anything," said Tyler [Kellett] . "That would be fun." They found a mastodon skeleton. 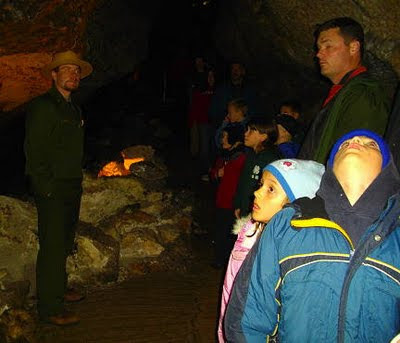 Above: Kids peer up at calcite crystals as our Park Service tour guide describes the formation of Jewel Cave. Outdoor travel in late September is always chancy. More than once we have faced the "disappearing campground blues," when forest and park campgrounds start closing, forcing you into more crowded quarters at the few the authorities deign to leave open (e.g., Madison Junction at Yellowstone). In Yellowstone last year, I kept thinking, "If this is the 'off-season,' I am glad that we did not come during the high season." There seemed to be plenty of people at all the auto-accessible geothermal features, not to mention the scores of wolf-cultists. 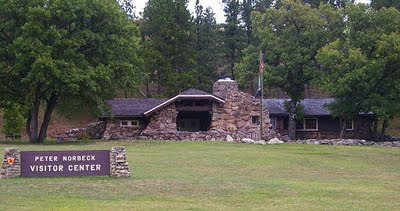 Likewise the Park Service thinking on ranger-led tours. When we came to Wind Cave on September 29th, all of the cave tours were canceled but one, the "Garden of Eden" tour, which M. and I decided should be called the "geezer tour." It lasted an hour, but most of that was just standing around listening to the ranger guide tell stories. He told them well, interweaving geology and history, but still, of miles of public cave trail, we saw maybe a quarter mile and three rooms, chiefly the room called the Garden of Eden by its discoverer in the 1890s. I assume there are staffing issues with seasonal rangers, etc., but it also seems that the Park Service assumes that anyone traveling after Labor Day is decrepit and unable to handle a longer walk and a few more stairs. For that "geezer tour" you pay $7. And, yes, we had a full tour group on a Tuesday afternoon. Things were somewhat better over at Jewel Cave National Monument. Again, some of their most interesting tours are offered only in the high season. But we were able to take the Scenic Tour—a half-mile loop, one hour and twenty minutes, $8 for an adult ticket—a better value than Wind Cave offered. There were more than 20 people in our group, on a snowy Thursday, October 1st, and another group was entering as we were leaving. There are plenty of "off-season" visitors. You spend a lot of time trooping along clanging industrial aluminum catwalks and stairs, which give the cave a sort of "secret lair of the super-villain" feel. But wood would not last well in the 99-percent humidity. And you see enough rooms, passages, formations, etc., to give you a real feeling for the cave, which actually includes about 140 miles of mapped passages. Notice the absence of geezers in the photo above. Home-schooled kids? Kids whose parents thought that they would benefit more from a cave trip than the classroom? Either way, I was happy to see them there. 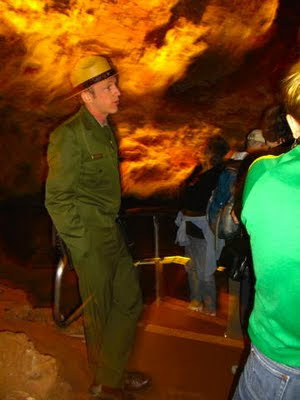 Wind Cave National Park ranger Garrett Roke leads a tour underground. It happened several time that when M. and I told friends we were going to South Dakota, the response was, "Why South Dakota? Despite the fact that the state tourist authority runs regular ads in the Denver Post Sunday travel section advertising the Black Hills, you do not see many green-and-white Colorado license plates here. Lots of Midwestern plates instead: Minnesota, Wisconsin, Nebraska, Iowa, etc. Bird-hunters may come for pheasant, etc., in the prairie counties, but the Black Hills don't draw us Coloradans. 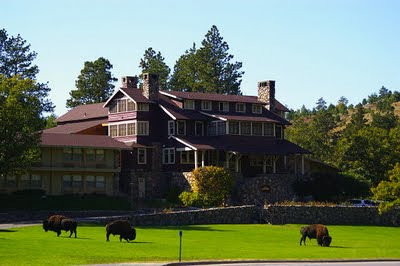 Yes, the eastern Black Hills are one of the most touristy and billboarded places you will see. When I was a kid, one of my regular playmates was the son of the manager of Reptile Gardens, a private zoo that put up more huge signs than any Black Hills "tourist trap," including Bear County USA, the Big Thunder gold mine, the Circle B Chuckwagon, and all the many others. We thought it was all normal at the time. One the other hand, Wind Cave National Park (28,295 acres) and the adjacent Custer State Park (71,000 acres) make up a mini-Yellowstone. What they lack in geothermal features and grizzly bears, they make up in underground stuff, in the case of Wind Cave, where interpretive ranger Garrett Roke describes 133 miles of explored passages underlying a square mile of surface area—incredibly complex, in other words. Exploration began in the 1880s with candles and balls of string and has not finished yet. Although the local Indian hunters probably knew about the cave's natural opening (still there), which only a small adult could wiggle through, they apparently made little or no use of it. No Chauvet-style cave paintings. And down the road is Jewel Cave National Monument, with less surface area but even more miles underground. More on it later. While my fondness for the Black Hills starts with having spent eight years there as a kid, I have good reasons for going back now and again. Some more photo posts will be forthcoming. 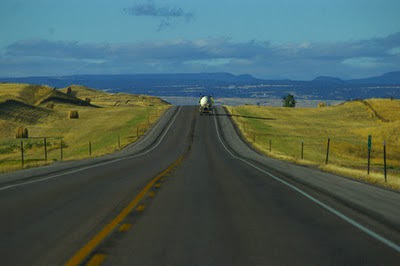 Today we leave Custer County on our way to Custer County (the one with Custer State Park) in it. The great cavalry tactician has quite a few things named after him. It's part of a shift in nomenclature that I notice when traveling north of the Platte. M. and I live at the northern edge of the tide of Baroquely religious Spanish place names, which is how it is that I belong to the Blood of Christ Shooting Sports Club—which sounds like something from Franco's Spain. But up there in the country of my boyhood, place names reflect a flint-hard animism (Spearfish, Sundance, Black Hills, Bear Lodge) or the memories of Army officers, from the luckless (Cherry County, Fort Fetterman) to the more competent: Sheridan, Fort Collins, Miles City, Sturgis, Crook County, Terry Peak. Which brings me back to Custer. On my trip north three weeks ago, I listened to the audiobook of James Donovan's A Terrible Glory: Custer and the Little Bighorn—the Last Great Battle of the American West. What I learned from it was not so much about the battle, which is covered elsewhere. Read whatever has been published since the archaeological work of the 1980s, such as Son of the Morning Star: Custer and The Little Bighorn or Soldiers Falling into Camp: The Battles at the Rosebud and the Little Big Horn . It was the politics. The post-Civil War Army was a real catfight, as officers fought for promotion in a shrinking military force, and back-stabbing was an art. Donovan describes how Custer and the man who would become his key subordinate at the Little Bighorn, Capt. Benteen, published anonymous letters attacking each other in newspapers during the 1870s. Talk about blogging about your boss! Yes, Custer's rashness led to the complete loss of his battalion, but he was also a convenient scapegoat, Donovan argues. Terry's caution, Crook's vacillations, Gibbon's hesitations—not to mention Benteen's hesitation to reinforce Custer when ordered—all were minimized in the official reports, while Custer took all the blame, being conveniently dead. Even the inquest into Major Reno's drunken cowardice at the Little Bighorn was affected by a desire to save regimental honor and blame Custer, Donovan suggests. As I drove north, occasionally the text and geography coincided, so that certain locales, such as those from the 1874 Black Hills expedition, coincided in the text and out the windshield. It's nice when that happens. Now M. will be with me, but we are not looking for Custer. Blogging will be irregular, maybe nonexistent, until we return. A news photog's shots of a recent prescribed burn at Wind Cave National Park in the Black Hills -- interesting to me partly because I plan to be there later this month. The forest is mostly ponderosa pine, and the Park Service offers its thinking on fire and forest ecology here.